Los Angeles used to be famously indifferent to its architectural legacy, demolishing any building that stood in the way of a new freeway–or, for that matter, a new building. (For what was lost, see Sam Hall Kaplan’s LA Lost and Found [Crown, 1987]) Downtown is probably the most altered part of the metropolitan area, having lost most of its pre-WWI buildings–including hundreds of Victorian homes–during the construction of the freeway system in the 1950s and 1960s. Yet the new-is-better sentiment of our City fathers, past and present, has long been a motto for the region. John Lautner (1911-1994) trained under Frank Lloyd Wright at Taliesin, where his apprenticeship included carpentry and plumbing. 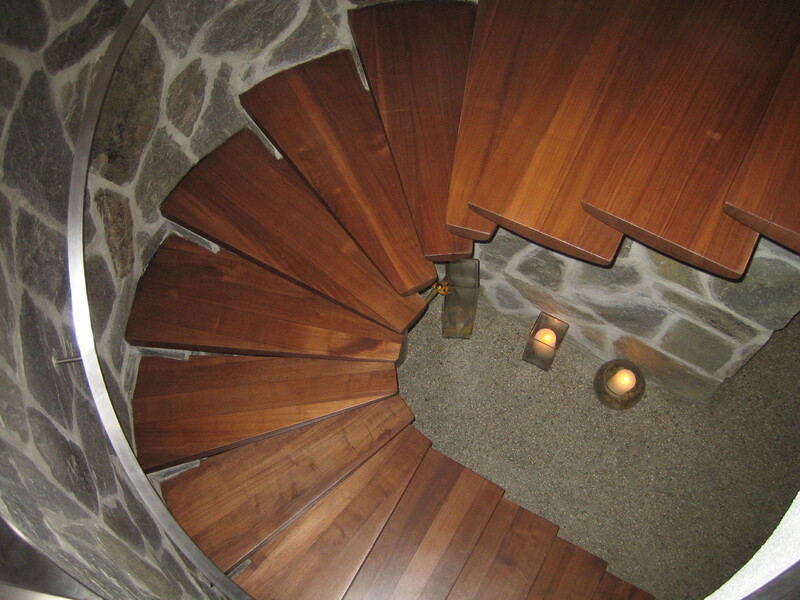 Like Wright, he believed in “total concept” architecture, where the building is indivisible from the site. Though he was from Michigan, Lautner chose to settle and establish his practice in Los Angeles because its climate, both physical and philosophical, provided the ideal laboratory for his geometric forms and indoor-outdoor ethos. Like his mentor Wright, he was democratic, designing houses for middle-class clients as few prominent architects do today. 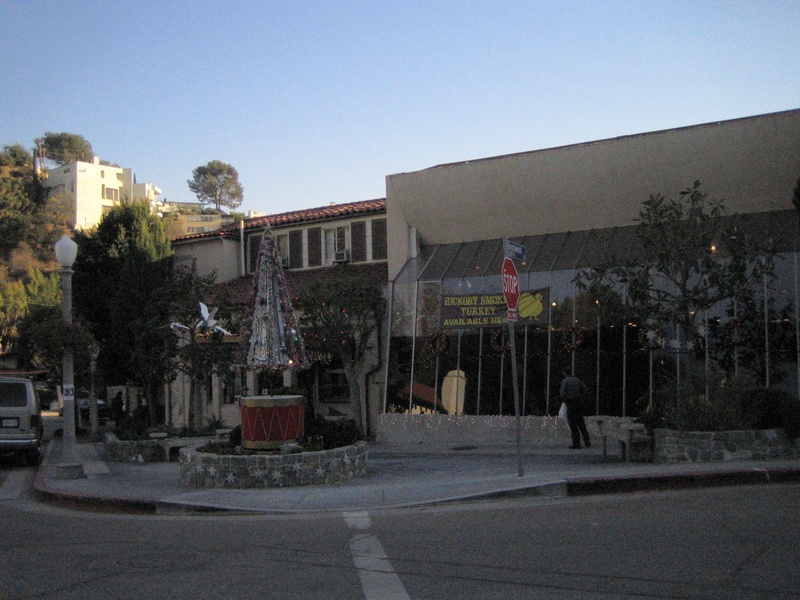 As a result, his houses are scattered throughout Southern California, including two in Beachwood Canyon. If the County allowed the Rehabilitation Center to be razed, Lautner’s public legacy would be halved, an odd fate for a man whose architecture is synonymous with mid-century Los Angeles. In that case, the most publicly accessible of his projects would probably be the glass addition of the Beachwood Market. 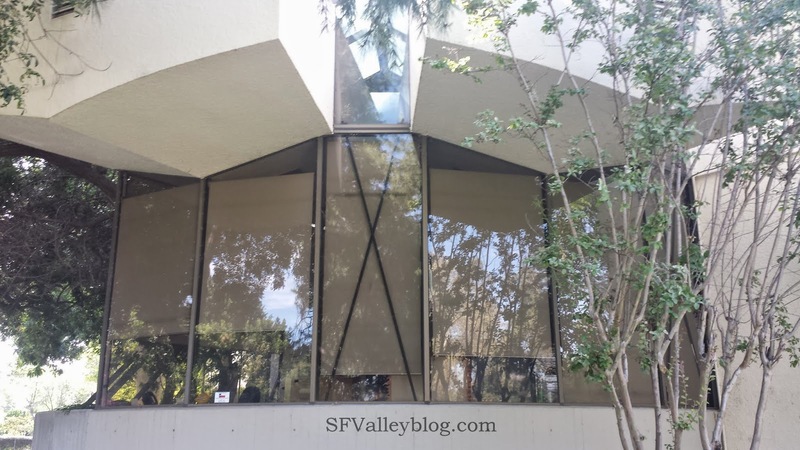 Built in 1954, it remains so modern-looking that City building officials who inspected it after the 1994 Northridge Earthquake assumed that it was new. 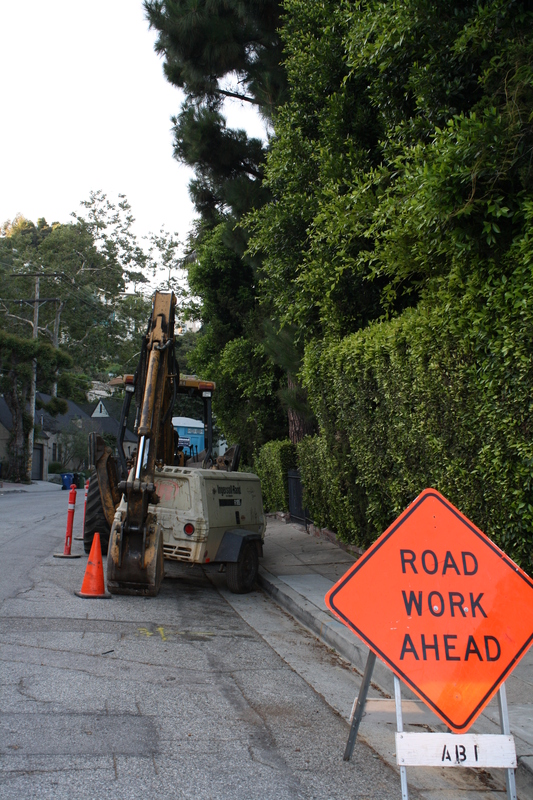 The sewer project that has been Hollywoodland’s most annoying daytime summer event started a couple of months ago but reached its apex, at least in my area, during the last couple of weeks. Fortunately, I missed 12 days of jackhammering during a recent vacation–the only time I can remember being gone during a noisy period. 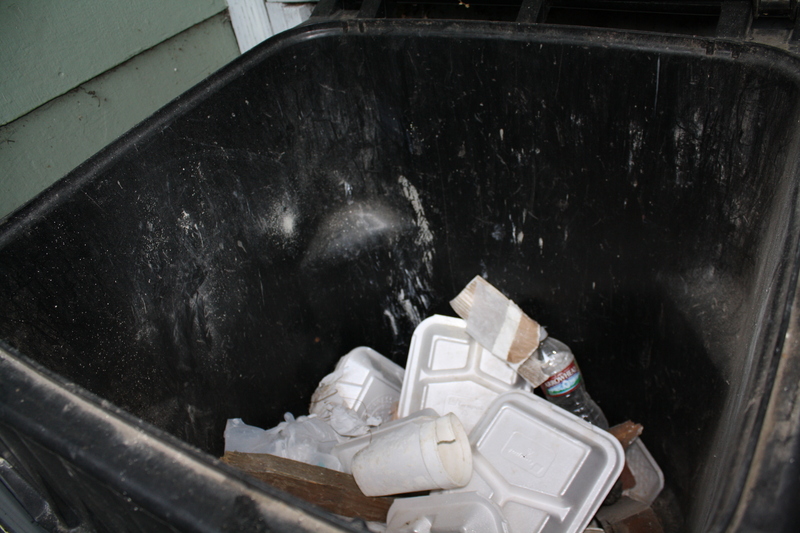 When I got back, I noticed a lot of trash in my black garbage bin–which was strange not only because I had been away, but because it was made up of styrofoam lunch boxes that should go into the blue recycling bin. That blue one, I noticed, contained empty concrete bags. 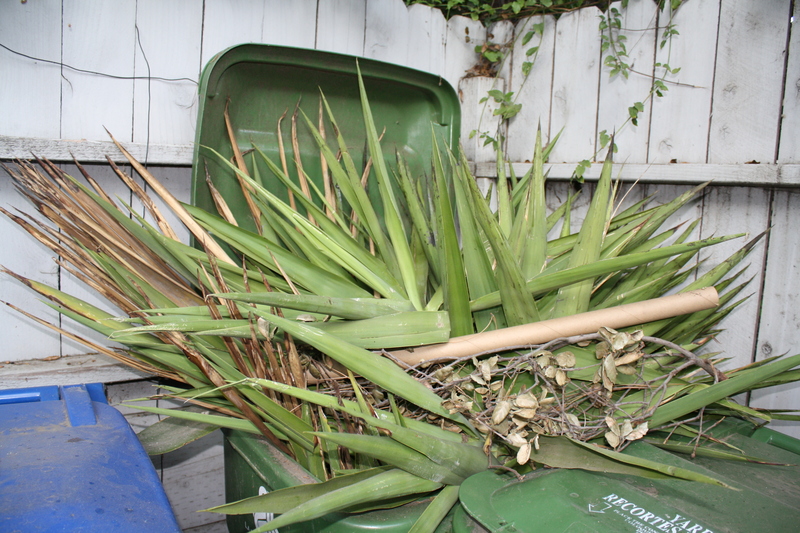 Then a couple of days later, I found one of my green garden bins overloaded with uprooted plants (and a cardboard tube). None of it was mine. It could only have been the detritus of MASCO, the subcontractor doing the sewer work for the City. Beyond the creepiness of having someone else’s incorrectly sorted trash in my bins, MASCO’s workers trespassed on my property, opening an enclosure in order to dump it. 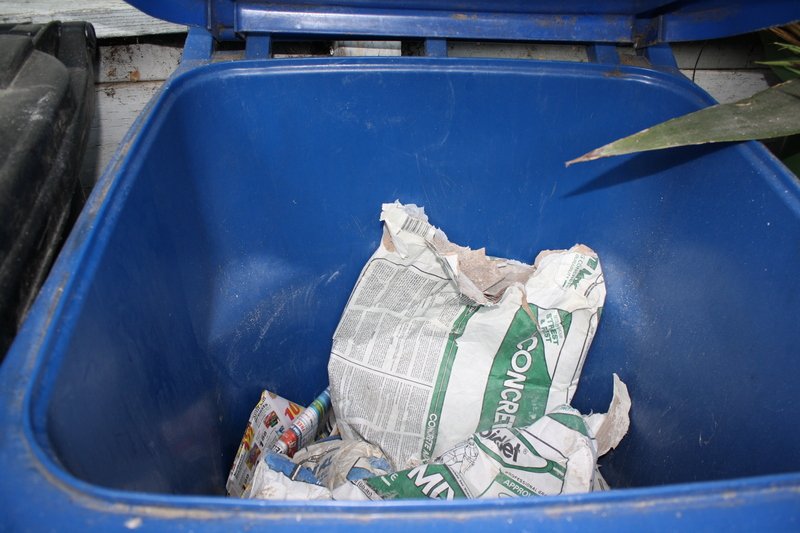 While it wasn’t the first time I’ve had my bins commandeered by strangers–phone company workers routinely dump trash in my bins while working on a nearby box–it was the most egregious. The next day, when I found MASCO workers directly outside my house, I said the least they could do was to sort their recyclables and move my bins to the curb. They agreed, yet when I returned at the end of the day, I found the bins in their usual place and the same styrofoam boxes in the black one. The green one was especially hard for me to drag to the curb. The next day I found a MASCO backhoe parked directly in front of my garage, preventing my exit. It was midday; no one was around, apparently because they were on their lunch break. Now running late, I had to race around a three-block area to find anyone from MASCO, at which point I unleashed a tirade about their lack of consideration. The worker pretended not to understand what I was saying, so I repeated it in Spanish. His attitude was somewhere between “who cares?” and bafflement. Because none of the workers would identify their foreman or give me their supervisor’s telephone number, I decided to track down someone in authority at MASCO. When I reached the supervisor, Alfred Garcia, and told him my story, he was appalled and apologetic, promising he would “talk to those guys.” I hung up feeling the worst was over, and was relieved when the crew decamped for another part of the Canyon. But early Thursday morning they were back, repaving a nearby street, and by 8:15am, there was a truck being parked in front of my garage. The driver was utterly mystified when I told him he couldn’t leave it there. 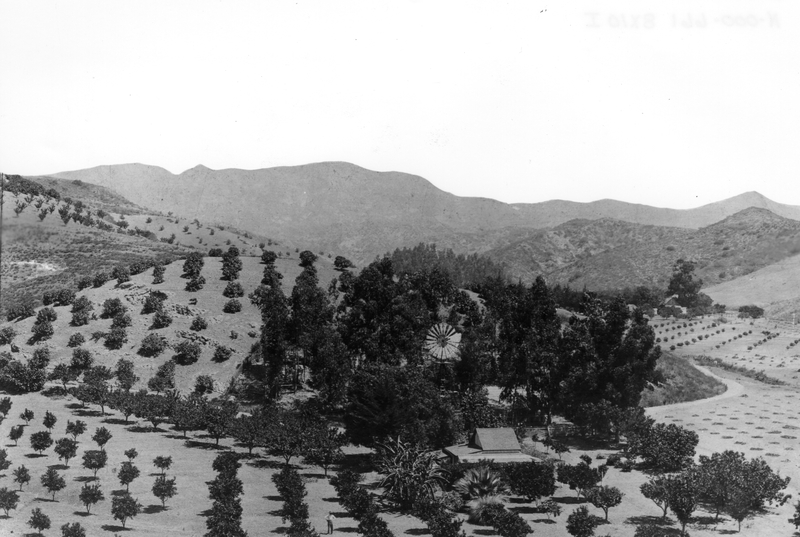 One of the best things about Hollywoodland is how little it has changed over the years. The Village Coffee Shop not only features fusty mid-century decor but a nostalgic menu from the same era. Next door, the friendly Beachwood Market allows account holders to sign for their groceries. And on the street, neighbors greet each other at such length that often it has taken half an hour to walk my dog six blocks. The Land That Time Forgot is a very pleasant place to live. So it came as a surprise to find graffiti on the historic Beachwood-Westshire stairs and the retaining wall on the landing halfway up. Written in yellow paint, the graffiti is subtle by LA standards. Still, it took me back to the 90’s in Hancock Park, where tagging was so prevalent that the City eventually gave up using neutral colors to paint over garage walls on Bronson between Wilshire and Sixth, instead executing murals of vines and berries. The murals did the trick, probably because they resembled graffiti. The funny thing about graffiti is how quickly one becomes accustomed to it, once the initial shock wears off. After I discussed it with my neighbors, the matter slipped my mind entirely. Apparently none of us contacted the City about eradicating it, because 18 months later it’s still there. Recently my son pointed out the graffiti appeared the same day Westshire got yellow markings from the street department and that the ink is identical. As if that weren’t enough, someone recently used the top of the same stairs as a toilet. I discovered the result on my way up to Westshire last Saturday. Horrified, I sidestepped it; my dog, following me, promptly pocketed the turd in her bag-like mouth and didn’t drop it until we got home. It was a disgusting experience and–in light of the fact that the neighborhood is a long, uphill walk away from Hollywood’s homeless encampments–a baffling one. Needless to say, my dog had her mouth washed out with soap and her teeth thoroughly brushed. 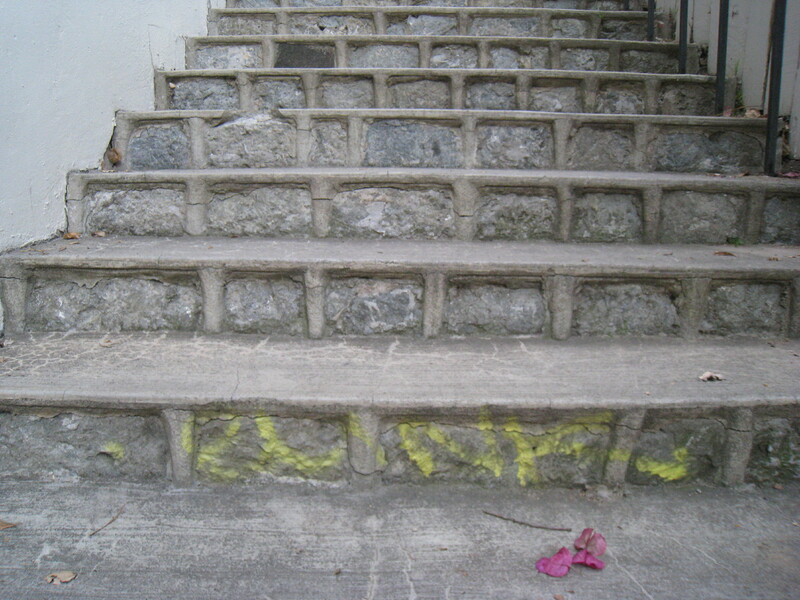 Once I recovered, I contacted the City about removing the graffiti on the stairs. I’m looking forward to hearing what they have to say about the tell-tale yellow ink. Update, July 21: After receiving an e-mail from the City claiming the graffiti had been removed, I went out yesterday to check. The graffiti on the wall is still visible, though perhaps a bit more faded, while the tagging on the stair (above) is untouched. If this is someone’s idea of abatement, we’re in trouble. 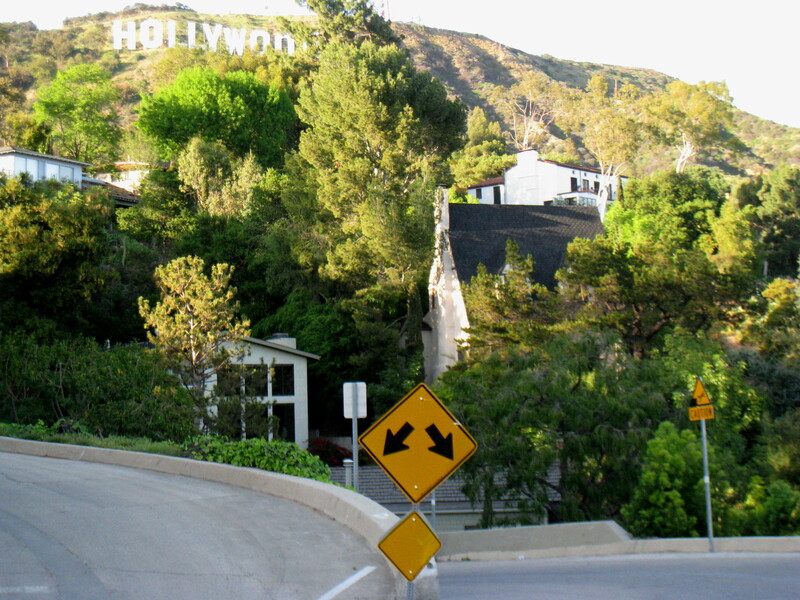 You are currently browsing entries tagged with City of Los Angeles at Under the Hollywood Sign.